Cambridge Springs was a health resort town (population 1,500) in northwestern Pennsylvania, famous for its spas and mineral waters. It advertised that it was the town that was halfway between New York and Chicago when you took the Erie Railroad line. Cambridge Springs is about 30 miles south of Erie, Pennsylvania. The town was founded in the early 1800s by German and Irish families. It was first called Cambridge Township, then Cambridgeboro. In 1897 it was changed to Cambridge Springs to acknowledge the importance of the mineral springs in the area. The mineral waters were supposed to cure almost anything. In 1895, William Douglas Rider, Jr. (1846-1905) started construction of what he hoped would be the greatest hotel between New York City and Chicago. The hotel was completed in 1897. It had over 500 rooms in a 7-story building on 5 acres. The hotel had its own theatre, two gymnasiums, bowling alleys, and an indoor pool. Every room had a telephone. The hotel grounds included a 9-hole golf course and a man-made lake. The hotel had over 3,000 incandescent and arc lights from its own electric plant. The lobby could accommodate 1,000 guests comfortably. In 1903, Rider wanted an international chess tournament at his Rider resort hotel. Most of the support and funding was provided by Rider and the directors of the Erie Railroad Company. Additional support was received from chess clubs around the country in the form of subscriptions to the daily chess bulletins. Another financial backer was Professor Isaac Leopold Rice (1850-1915), a millionaire who made his fortune as a corporate lawyer. He was a chess patron who gave his name to the Rice Gambit in the King's Gambit Accepted (1.e4 e5 2.f4 exf4 3.Nf3 g5 4.h4 g4 5.Ne5 Nf6 6.Bc4 d5 7.exd5 Bd6 8.O-O Bxe5 9.Re1). Another financial backer was Baron Albert de Rothschild (1844-1911) of Vienna. The prize fund was $3,100 (equivalent to $86,000 in today's money; $100 in 1904 would cost $2,800 in 2018). The event would be played from April 25 to May 19, 1904 and be called the 1904 Cambridge Springs International Chess Congress. It was the first international tournament in America in the 20th century. It was the first major international chess tournament in America since the Sixth American Chess Congress in 1889, held in New York. There would not be another major international chess tournament in American until the New York 1924 tournament. Baron Rothschild donated $100 (20 British pounds) for the brilliancy prize of the tournament. The invited chess players that participated were John Barry, Mikhail Chigorin, Eugene Delmar, Albert Fox, Albert Hodges, David Janowski, Emanuel Lasker, Thomas Lawrence, Georg Marco, Frank Marshall, Jacque Mieses, William Napier, Harry Pillsbury, Carl Schlechter, Jackson Showalter, and Richard Teichmann. Geza Maroczy was invited, but he telegraphed that the authorities of the university where he is a Professor of Mathematics could not give him leave for the necessary period of absence (source: British Chess Magazine, May 1904, p. 191). Samuel Lipschuetz (1863-1905) was invited, but he had to withdraw his entry on advice from his doctor in view of the severe strain on his lungs for such an event. Siegbert Tarrasch was invited, but he was busy as a medical doctor and was avoiding chess tournament in which Emanuel Lasker was participating. They would not face each other until St. Petersburg 1914. Two other possible invitees were Amos Burn and Henry Atkins. Julius Finn (1871-1931), former New York State Champion, was supposed to be one of the replacements, but that did not occur. Also, Edward Hymes would have been chosen as a replacement, but he said he could not spare the time from his professional duties as an attorney. On Friday, April 15, 1904, eight of the strongest chess players from Europe arrived in New York by ship (S.S. Pretoria). This included current world chess champion (1894-1921) Emanuel Lasker (1868-1941) coming from Berlin, Russian champion and number two player in the world Mikhail Chigorin (1850-1908) coming from St. Petersburg, number 6 player in the world Carl Schlechter (1874-1918) coming from Vienna, Berlin champion and number 7 player in the world Richard Teichmann (1868-1925), French champion and number 8 player in the world David Janowski (1868-1927) coming from Paris, Viennese champion and number 11 player in the world Georg Marco (1863-1923) coming from Vienna, German master and number 15 player in the world Jacques Mieses (1865-1954) coming from Leipzig, and 6-time London champion Thomas Lawrence (1871-1953) coming from London. Along with the European masters, the Americans had, American champion and number 3 player in the world Harry Nelson Pillsbury (1872-1906) coming from Philadelphia, New York champion and number 10 player in the world Frank Marshall (1877-1944) coming from Brooklyn, former American champion Jackson Showalter (1860-1935) coming from Kentucky, Brooklyn Chess Club champion Albert Fox (1881-1964) coming from New York, former Brooklyn champion William Napier (1881-1952) coming from Pittsburgh (he won the British championship after this tournament in 1904), former US Champion and New York State Champion Albert Hodges (1861-1944) coming from Staten Island, New England champion John Barry (1873-1940) coming from Boston, and 4-time NY State Champion Eugene Delmar (1841-1909) coming from New York. Of the top 11 players on the world, only Tarrasch (#4) , Maroczy (#5), and Blackburne (#9) were missing. On April 15, 1904, there was a Mayor's reception of the chess players at City Hall in Manhattan. That evening, there was dinner for all the chess players at the residence of Isaac Rice. On April 16, 1904, there was a dinner for the chess players at the Manhattan Chess Club. On April 17, 1904, there was a reception for the chess players at the Cosmopolitan Chess Club in New York. On April 18, 1904, there was a reception for the chess players at the Brooklyn Chess Club. On April 19, 1904, the European masters traveled to Washington, D.C. where they were greeted by President Theodore Roosevelt (1858-1919) at the White House. They then traveled to New York, toured the city, and then went on to Cambridge Springs. The participants for the tournament arrived in Cambridge Springs on April 22, 1904. On April 25, 1904 the first round of one of the strongest chess tournaments ever held began at the Hotel Rider in Cambridge Springs, Pennsylvania. The event was a single-round-robin tournament. Games were played on Monday, Tuesday, Thursday, and Friday. Wednesday was for adjourned games to be played. Saturdays were for Rice Gambit consultation games. The tournament rules, adopted from the 1895 Hastings Chess Congress, forbade consultation on adjourned games. You could not even enter a room with any other player during the intermission period between 3 pm and 5 pm. No draws were allowed under 30 moves unless it was a forced draw (there were only 2 draws less than 30 moves). Play was from 10 am to 3 pm, then from 5 pm to 7 pm. The time control was 30 moves in 2 hours, then 15 moves each hour thereafter. The rules were adopted by the players on April 24, 1904. World champion Lasker had not played in a chess tournament in four years. His last tournament was Paris in May-June 1900, which he won with 14 wins, 1 draw, and 1 loss. He would not play in another chess tournament after Cambridge Springs for another 5 years (St. Petersburg 1909), which he tied for 1st with Rubinstein. For the first time in chess tournament history, a daily chess bulletin was produced showing all the games from the previous day's round. The daily chess bulletins were sold to chess clubs around the country. Cambridge Springs was the first international tournament for Barry, Fox, Hodges, and Lawrence. The tournament was held on the stage in the theatre of the Rider Hotel, which could seat 500 people. Over 200 reporters from around the world were present for the chess tournament. During the tournament, a Rice Gambit consultation team event was held. Historical ratings of the players were: Marshall — 2658, Janowski — 2750, Lasker — 2675, Showalter — 2599, Chigorin — 2759, Mieses — 2653, Marco — 2655, Schlechter — 2727, Fox — 2590, Lawrence — 2621, Pillsbury — 2771, Teichmann — 2705, Barry — 2568, Delmar — 2524, Napier — 2625, and Hodges — 2496. On May 19, 1904, Frank Marshall, age 26, won the Cambridge Springs International with 13 points out of 15 (undefeated) and winning $1,000 (equivalent to $24,000 in today's money!). He won 11 games and drew 4 (drew with Lasker, Marco, Chigorin, and Napier). This event was considered Marshall's greatest triumph. The British Chess Magazine called Marshall's victory one of the most remarkable events in chess history. Lasker and Janowski (both 35 years old) tied for 2nd-3rd with 11 out of 15. Lasker lost to Schlechter and Pillsbury in round 6. Janowski lost to Marshall, Lasker, and Fox. The players split $900. Marco (age 40) took 4th place ($200) with 9 points; Showalter (age 43) took 5th place ($165) with 8.5 points; Schlechter (age 29) and Chigorin (age 53) took 6th-th place (split $135) with 7.5 points; Mieses (age 38) and Pillsbury (age 31) took 8th-9th place with 7 points; Teichmann (age 35) and Fox (age 23) took 10th-11th place with 6.5 points; Napier (age 22) and Lawrence (age 33) took 12th-13th place with 5.5 points; Hodges (age 42) and Barry (age 31) took 14th-15th place with 5 points; Delmar (age 53) took 16th (last) place with 3 wins, 3 draws, and 9 losses, for 4.5 points. Delmar was the oldest player. Napier and Fox were the youngest players. This tournament was probably the strongest international tournament held on American soil. This was Pillsbury's last tournament. He died 2 years later at the age of 33. Napier started dating Pillsbury's niece and later married her. Out of the tournament came the opening known as the Cambridge Springs Defense (1.d4 d5 2.c4 e6 3.Nc3 Nf6 4.Bg5 Nbd7 5.e3 c6 6.Nf3 Qa5). This opening was actually introduced by Pillsbury at Nuremberg in 1896. Three games used this opening. Teichmann as Black tried it against Marshall in round 8 and lost in 58 moves, then tried it against Schlechter in round 14 and drew in 30 moves. Barry tried it against Hodges in round 11 and lost in 23 moves, so it was not successful. The daily chess bulletins produced by Hermann Helms proved so popular that Helms started the American Chess Bulletin. In June 1904, the American Chess Bulletin, Volume 1, No. 1, was published by Hermann Helms and Hartwig Cassel. 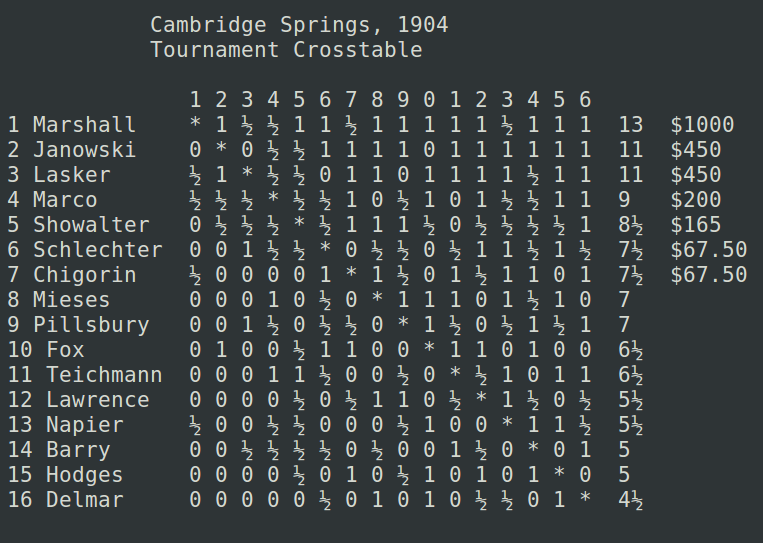 It included all 120 games from Cambridge Springs and was the first "book" written about the tournament. The American Chess Bulletin would be edited and published by Helms from 1904 until his death in 1963. Just after the tournament, Marshall's father and Showalter's father (age 94) died. After the tournament, Napier went to England where he won the London championship in July-August and the first British Chess Federation championship in August-September. After this event he retired from chess. After the tournament, Teichmann went to London and won the Rice Gambit tournament. After the tournament, Schlechter went to Coburg, Germany and tied for 1st at Coburg (14th German Chess Association). In October 1904, Marshall won the 7th American Chess Congress in St. Louis. In November 1904, Lasker decided to stay in the United States and started his own chess magazine. The magazine continued until 1909. Chigorin returned to Russia and won the St Petersburg championship. Rider wanted to continue holding annual international chess tournaments in Cambridge Springs, but he died on September 13, 1905. In 1906, Harry Pillsbury died of syphillis. The Rider Hotel was later renamed the Vanadium. In 1912, the Hotel Rider was sold to the Polish National Alliance College. President William Taft was on hand for the opening ceremonies of the new technical school in October 1912. The building burned to the ground in 1931. Later rebuilt, the college housed the largest collection of Polish writing in the United States. Alliance College operated at Cambridge Springs until it closed in 1987. The buildings now houe a correctional facility for women. In 1935 Fred Reinfeld published a book on the Cambridge Springs event. In 1988 the U.S. Chess Championship was held in Cambridge Springs. The chess championship was held in one of the few hotels remaining from the railroad resort era, the Riverside Inn, built in the late 1880s. In 2004, the Cambridge Springs chess tournament had its Centennial celebration. GM Larry Evans gave a lecture and a simultaneous exhibition. John Finan Barry (1873-1940) was a Boston lawyer and strong chess amateur. He served as Clerk of the Municipal Court in Boston for 28 years. He played in 12 of the 13 Anglo-American (1896-1911) cable matches, missing the 1908 match because of a misdelivered invitation. In 1893, he played a match against Harry Nelson Pillsbury and was 4 games up, but then lost 5 games and drew one game to lose the match. In 1896, he played a match against Jackson Whipps Showalter for the U.S. chess championship, but lost after winning 2, losing 7, and drawing 4. He played at Cambridge Springs, Pennsylvania in 1904. He was New England champion from 1912 to 1935. He was president of the Boston Chess Club. In 1915, he began a chess column in the Boston Transcript that ran for 25 years. He died in West Roxbury, Massachusetts on April 9, 1940. Mikhail Ivanovitch Chigorin (Tchigorin) (1850-1908) was founder of the Russian school of chess. He was the first public chess worker, organizer, and journalist in Russia. He learned to play in at the age of 16. His schoolteacher taught him to play, but he did not take chess seriously until he was 27 and working as a government officer. For seven years, he did not play chess at all. In 1873 he started playing chess seriously and hustling chess at the Cafe Dominic in St. Petersburg. He was 23. By the age of 28, he would be the strongest chessplayer in Russia. In 1875, he gave up his government post job to be a full time chessplayer after being encouraged by Winawer. Chigorin was the first Russian to devote all his life to chess. His first chess magazine, Schachmati Westnik (Chess Sheet), only had 250 subscribers in all of Russia. From 1878 to 1907 he was considered the best Russian chessplayer. In 1881, he played in his first international chess tournament, held in Berlin. He tied for 3rd place, behind Blackburne and Zukertort. In 1889 he unsuccessfully challenged William Steinitz for the world championship in Havana, which ended after 17 games and only one draw (the last game). Steinitz had won 10 and lost 6. A month later Chigorin tied with Weiss for 1st place in America's first international tournament, New York 1889. He took second place in the Hastings 1895 tournament (behind Pillsbury). Chigorin was only ½ point behind Pillsbury and was leading up to the last round. However, Chigorin lost his last round game to Janowski and missed winning 1st prize. At Hastings 1895 he won a ring and a copy of Salvoli's The Theory and Practice of Chess for winning the most Evans Gambits. He won the first three All-Russia tournaments (1899, 1900-01, 1903). In 1958 the USSR issued a chess stamp with a portrait of Chigorin. He learned chess at age 16 (some sources say he learned chess in his early 20s). At 9:50 pm on January 25, 1908 (Jan 12, Old Style) Mikhail Chigorin died of diabetes in Lublin, Poland at the age of 57. Several years later, his body was moved to the Novodevichy Cemetery in St. Petersburg. Eugene Delmar (1841-1909) was born in New York City on September 12. 1841. In 1874, he won the Brookyn Chess Club championship. In 1876, he tied for 2nd place in the New York Clipper tournament, behind James Mason. In 1879, he defeated Sam Loyd in a match in New York (+5-1=2). In 1885, he won the 7th and 8th Manhattan Chess Club championship. In 1888, he defeated Samuel Lipschuetz in a match in New York (+5-3=0). In 1890, 1891, 1895, and 1897, he won the New York State Chess Association championship. In 1904, he took last place at Cambridge Springs (+3-9=3). For over 50 years, he was a leading chessplayer in America. He died on February 22, 1909 in New York City. Dr. Albert Whiting Fox (1881-1964) was an American chess master from Boston. In 1905/06 he won the Manhattan Chess Club Championship. Albert Beauregard Hodges (1861-1944) was a former U.S. chess champion. He learned chess at age 19. His first job was a hidden operator of Ajeeb, the chess automaton, at the Eden Musee in New York. He then won the championship of the Manhattan Chess Club and also became New York State Champion. He took part in all 13 Anglo-American cable matches without losing a single game. He founded the Staten Island Chess Club and served as its President for 12 years. He won the U.S. chess championship in 1894 by defeating Jackson Whipps Showalter in a championship match by the score of 5-3 with one draw. After accomplishing his life's goal of becoming the U.S. chess champion, he announced he was retiring from chess and never defended his title. He then became an accountant and businessman and gave up chess. He played 5 world champions over a period of 60 years. He died of a heart attack at his Staten Island home. David (Dawid) Markyelovich Janowski (1868-1927) was a Polish-born French chessplayer of Grandmaster strength and addicted gambler. In 1901, he won an international tournament at Monte Carlo and lost all his first-place money in the casino the same evening the tournament ended. The casino management had to buy his ticket home. In another event he handed his money to a friend and made him promise not to return it until after the chess tournament. However, the lure of gambling proved too strong and he begged for the return of his money. His friend refused. Janowski was so infuriated that he sued his friend. Janowski had a chess patron, the Dutch painter Leo Nardus who, for many years, supported him in chess. He lost his support when Janowski called Nardus a chess idiot when Nardus suggested an alternate move during an analysis of one of Janowski's games. Janowski was famous for his complaints which served as alibis when he lost. At one tournament, every one of his requests was granted and for the first he had nothing to complain about. When he lost the tournament he said, "You have deprived me of any alibi. How did you expect me to play good chess?" He died of tuberculosis, the night before he was to start play in a small chess tournament in Hyeres, France. A subscription was raised to prevent his being buried in a pauper's grave. Thomas Francis Lawrence (1871-1953) was an English chess master from London. He won the championship of the London Chess Club 6 times. He drew twice against Pillsbury in the cable matches. Georg Marco (1863-1923) was a Romanian-born Austrian of Grandmaster strength. He was a very large and powerful man. He was referred to as the "strongest" chessplayer in the world because of his physical strength. He was primarily known as a chess analyst for Wiener Schachzeitung in Vienna from 1898 to 1916. He began as a medical student but gave it up for chess. He was secretary of the Viennese Chess Association. He was a journalist by profession. Frank James Marshall (1877-1944) was born of British-Scottish parentage on the west side of Manhattan (8th Avenue and 50th Street) in New York City on August 10, 1877 (a dozen other sources say he was born on August 21, 1877). His father, Alfred, was engaged in the flour business. Frank had three younger brothers. The surprise upset victory of Marshall at Cambridge Springs in 1904 marked his rise to prominence in American chess. He would eventually reign as US chess champion for the next 26 years. In 1912, Frank Marshall defeated Stefan Levitsky in a brilliant game by making an unexpected queen moves on a square where it could be captured by three of Levitsky's pieces. Frank Marshall wrote that right after the game, "the spectators...threw gold pieces on [his] board at the conclusion of [his] brilliant win over Levitsky." Years later, Marshall's wife, Carrie, denied this ever happened. She said there wasn't even a shower of pennies. Another explanation was that the players and the spectators were just paying off their bets on the game. In 1915, he opened up 'Marshall's Chess Divan,' which later became Marshall's Chess Club. In the early 1930s, an amateur approached Frank Marshall, who was the US champ at the time, and asked for help in a postal chess game. Marshall obliged and played a few opening moves. A few days later, another amateur dropped in at the Marshall Chess Club to also seek help in a postal game from Marshall. Marshall realized the game of the second player was with the opponent who had come in a few days earlier. Marshall helped the second player and then ended up playing himself for several months as the two amateurs marveled at how their opponent was able to play on for so long against the great Frank Marshall! On November 9, 1944, he was walking to some friend's house around 7:30 pm when he collapsed and died in the street of a heart attack. He was 67. For 57 years he played chess almost every day. He took a pocket chess set to bed with him at night so that he might record a game or position from his dreams. Jacques Mieses (1865-1954) was born to a Jewish family in Leipzig, Germany. In 1882, at the age of 17, he won the championship of Berlin. In Vienna 1903, Mieses had been going strong in The Vienna Gambit tournament. In the 13th round he was to play Isidor Gunsberg (1854-1930). Not that Gunsberg wasn't a fine player, but the wide-open games resulting from gambits were not his forte, and in addition he seemed to be completely out of form. Out of the previous twelve games, Gunsberg had lost 10 and drew 2, and was in last place. Mieses had already chalked up the point mentally. But, as so often happens, the tail-ender of the tournament had one good game in him. He let loose with everything he had, and Mieses had to resign after 50 moves. Mieses commented bitterly, "It is bad enough to get run over, but to get run over by a corpse is horrible!" This was Gunsberg's only win. He lost 15, drew 2, and won 1 in the tournament (source: Chernev, The Bright Side of Chess, pp. 13-14). After living in Germany for 73 years, Mieses moved to England in1938 to escape Nazi persecution. He became a naturalized British citizen after World War II. In March 1949, Mieses, age 84, defeated Dirk van Foreest (1862-1956), age 86 during an exhibition game at The Hague. After the game, Mieses was quoted as saying, "Youth has triumphed." He was awarded the Grandmaster title in 1950, at the age of 85, for his past efforts, becoming the first British grandmaster. William Ewart Napier (1881-1952) was an English-born player. He family moved to Brooklyn, New York when he was 5. He started out studying music (he was a pianist and vocalist) in England, but mostly studied chess instead. In 1896, at the age of 15, he won the Brooklyn Chess Club Championship. In 1901, he took 2nd in the New York State Chess Championship. In 1904, he won the City of London Chess Club championship. He won the first British Chess Federation chess championship in 1904. He became a U.S. citizen in 1908. He married Harry Pillsbury's niece. He turned to journalism and wrote for newspapers in seven different countries. He later became secretary of the Banker's Life Insurance Company. He then became secretary, then vice-president of the Scranton Life Insurance company. Henry "Harry" Nelson Pillsbury (1872-1906) was the next great chessplayer after Paul Morphy (1837-1884). He learned chess at age 15. In April 1893, he beat the visiting master Walbrodt, and afterwards, began his career as a professional chessplayer. In 1894-95, he captained the Brooklyn Chess Club to victory in the Metropolitan Chess League. In June 1895, the Brooklyn Chess Club selected him as its representative to the Hastings Chess Congress after raising $300. Pillsbury sailed to England on July 24, 1895. When Pillsbury arrived in Hastings, he refused to stay at a hotel that had any of the other players in the Hastings Chess Congress. He said, "I want to be quiet; I mean to win this tournament." And he did. In August-September 1895, he played at the Brassery's Institute in Hastings and won the event at the age of 22. He won 15 games, drew 3 and lost 3. After losing to Chigorin in round 1, he won 9 games in a row. At the time, no player had ever won their first major tournament the first time playing it. He finished ahead of reigning world champion Emanuel Lasker, former world champion William Steinitz, and world chess challengers Mikhail Chigorin, Isidor Gunsberg, Siegbert Tarrasch, Carl Schlechter, and Dawid Janowski. First place for Pillsbury was $1,000 (about $26,000 in today's currency). In 1896, U.S. chess champion Harry Nelson Pillsbury (1872-1906) resigned from the Manhattan Chess Club (he had earlier won the Manhattan CC championship) because someone (J. Elson) took his umbrella and that umbrellas were not safe in the club house. (source: Brooklyn Daily Eagle, July 3, 1896). Cambridge Springs 1904 marked the end of Pillsbury's chess career. He would not play another tournament before his death in 1906 at the age of 33. His death certificate died of syphilis (general paresis), which he probably caught from a prostitute in Saint Petersburg about 10 years before his death. In March 1905, he tried to jump out a 4th story window at the Presbyterian Hospital in Philadelphia. He was stopped by several nurses and doctors. He died at Friends Asylum in Frankford, Pennsylvania. His obituary in the New York Times stated that he died from an "illness contracted through overexertion of his memory cells." He was only 33. Pillsbury's family denied a report that his brain was willed to any institution or scientists for any purpose of scientific investigation (source: Brooklyn Daily Eagle, Jun 19, 1906). However, Dr. Elmer E. Southard (1876-1920), Professor of Psychology at Harvard University, and a strong chessplayer himself, was able to get Pillsbury's brain and studied it. Dr. Southard studied the brain of Pillsbury in an attempt to decide whether a genius for chess tends to deteriorate the mind. He found no difference between a chessplayer's brain and anyone else's brain. Carl Schlechter (1874-1918) was Viennese player who was ranked in the top 5 in the world. He learned chess at age 16. He was the quietest of all grandmasters. He was known as the "drawing master" as he drew half of his 800 tournament and match games. In 1883, he played a match with Marco and all 10 games were drawn. He was one of the few grandmasters who also composed chess problems. In 1910, he drew a match with Emanuel Lasker (1 win, 1 loss, 8 draws). All he needed to do was draw his last game, but he lost it and the match. Some view this match as a world championship match. He edited the last edition of Von Bilguer's Handbuch des Schachspiels. He was editor of the Deutsche Schachzeitung, the leading German chess periodical. On December 27, 1918, Schlechter died from pneumonia and starvation in Budapest, Hungary, during the war-imposed famine in Central Europe. He never mentioned to any of his acquaintances that he needed food or money. He was found in a room without any money, heat or food. He was buried in Budapest on December 31, 1918. He was only 44. Jackson Whipps Showalter (1860-1935) learned chess at age 8 from his older brother, John, who served as Judge of the U.S. Circuit Court, being appointed to that position by President Grover Cleveland. In 1890, he won the United States Chess Association's 3rd Annual Congress Championship tournament in St. Louis. Shortly after this tournament in 1890, he lost a match to Max Judd by a score of 7-3. In 1892, he defeated Judd by the score of 7-4. In 1894, he defeated Albert Hodges by the score of 8-6. Later in 1894 Showalter lost to Hodges in a return match with a score of 5-3. In 1895 Showalter defeated Simon Lipschuetz, Emil Kemeny, John Barry, and Adolf Albin in matches. In 1897 Showalter lost to Harry Pillsbury by the score of 9.5-11.5. In 1898, Showalter lost a return match with Pillsbury by the score of 4-8. In 1909 Showalter lost to Frank Marshall by a score of 3.5-18.5. His nickname was the Kentucky Lion. 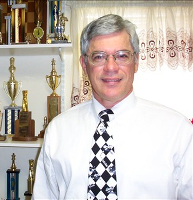 He was a 5-time U.S. chess champion, an avid baseball fan and amateur player. He was a noted pitcher in Lexington, Kentucky, and famous for his curve ball (he did not invent it as some sources say). He was the first man in Kentucky to pitch a curve ball (source: Chess Review, March 1935, p. 63). He was known as the Kentucky Lion after his birthplace and his mane of hair. He married Nellie Love Marshall when she was 16. She was one of the strongest women chessplayers in America in the 19th century. Richard Teichmann (1868-1925) was a student of modern languages and studied in Berlin. In 1891, he won the chess championship of Berlin. He was one of the top chessplayers in the world at the beginning of the 20th century. He was handicapped by chronic eye trouble and wore a patch over his right eye. He is often quoted as saying "Chess is 99% tactics." During World War I, he was suspected of British sympathies (he lived in England for 10 years), and moved to Switzerland. British Chess Magazine, June 1904, pp. 221-228. "Chess Honors for Marshall," The New York Press, May 20, 1904, p. 3C Helms, American Chess Bulletin, October 1904. Llczuk & Panczyk, The Cambridge Springs, 2003. Reinfeld, The Book of the Cambridge Springs International Tournament, 1935. Schroeder, James, Great American Chess Tournaments: Cambridge Springs, Pennsylvania, 1904, 1992. Spraggett, "Tidbits on Cambridge Springs 1904," Spraggett on Chess web site.